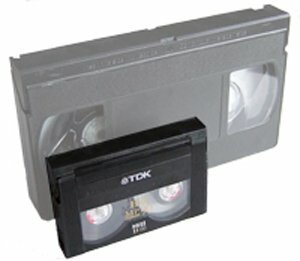 Video8 (or 8mm) tape was introduced in 1985. These were the most popular consumer camcorder tapes through the 90s due to their small form factor and high quality. Typically tapes can hold between 30 minutes and two hours or more if recorded in LongPlay. Hi8 is a higher quality version of Video8 and Digital8 is a digital version. The three formats are physically very similar, featuring both the same tape width and near-identical cassette shells.